Rhino-Shield gives exceptional protection against spills, stains, soil, and oil. See a demo of Rhino Shield on YouTube. Refreshes the lost performance of stain resistant carpets from everyday wear, fortifying their ability to resist re-soiling and staining. 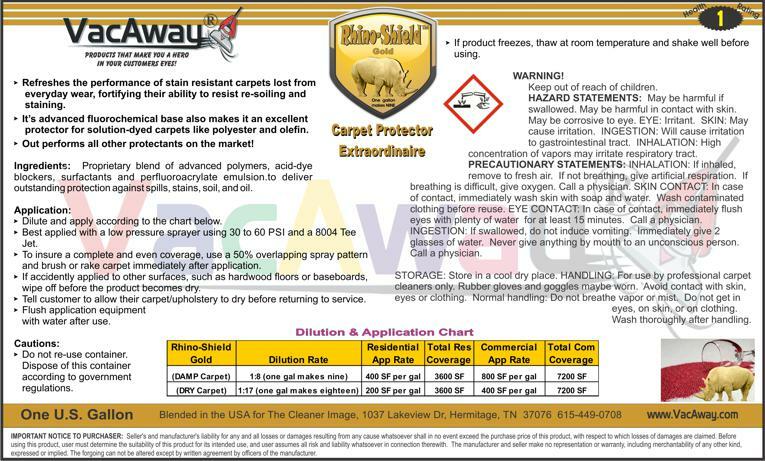 It's advanced fluorochemical base also makes it an excellent protector for solution-dyed carpets like polyester and olefin. It out-performs, in every way, all of the "Big Name" protectants that claim protection against acid dyes. Gold: Dilutes 1:8 to make nine gallons of RTU protector that covers 3600 sq ft of residential carpet. Silver: Dilutes 1:2 to make three gallons of RTU protector that covers 1200 sq ft of residential carpet. From Anonymous of Kuna, Idaho on 6/19/2015 . When used alone, it is by far the best protector I have used. In conjunction with Kleenshield it makes nylon as Bullet-Proof as you can possibly make it!